Courtney received her Bachelor of Arts in Biology from Olivet College in Olivet, MI. She then went onto Central Michigan University where she received a Master of Science in Physician Assistant Studies. Prior to her role at Allure Dermatology, Courtney worked for a dermatology and laser center in Okemos, MI and an urgent care and family practice in Saginaw, MI. Courtney is a NCCPA Certified Physician Assistant and certified in CPR by the American Heart Association. 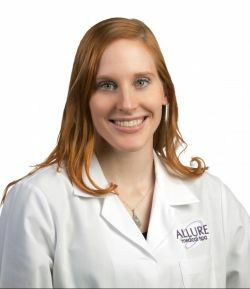 She sees patients at Allure Dermatology’s Shelby Township location.